Well my lovelies I am sorry for the radio silence of late but I have been busy getting my website together and I am excited to say that we are almost ready now so keep your eyes peeled as it will be on its way very soon. In the meantime I have had a bit of a stressful week or two and by today I really was feeling that “frazzled friday feeling”, I don’t know about you but when the sun comes out us guys who live in the Northern Hemisphere tend to go a bit bonkers for a few weeks due to the sheer delight of having an abundance of daylight and sunshine too. I have been totally transformed by the change in weather and what with deadlines and probably a Vitamin D overdose from desperately wanting to spend every waking moment of daylight outside, I have slightly over done it !! So when I came across an article about Nettle Tea my ears pricked up with interest. Nettle Tea is a great support to the Adrenal Glands which helps with mobilisation of energy and regulation of our bodies metabolism. It is supposed to help with urinary issues, joint pain, hay fever, eczema and a whole load more besides. I am not a trained Herbalist but it made for interesting reading. As I was out walking just now I came across this patch of juicy nettles and thought why not give it a try. So as I had no gloves to hand I used a dock leaf instead which did the job. See below the little video of how I did it and I apologise now for the last image of the blurry tea cup, technology got the better of me. 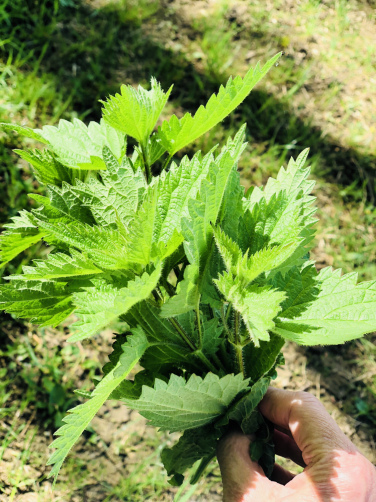 If you feel inspired to give this a try over the weekend then remember to find a lovely juicy patch of fresh green nettles which hasn’t been sprayed with nasties and then you are good to go.